PRIMARY schoolchildren have joined the fight against a planned new Tesco in Mill Road. Youngsters from nearby St Philip’s Primary School have bombarded the Newswith letters criticising plans by the supermarket giant to open an Express store at the former Wilco site. The flurry of letters follows a school project on the issue, which saw Year 6 pupils take to the streets to interview 234 people on Mill Road, with 70 per cent saying ‘no’ to Tesco. It follows a demonstration by 600 residents against the plans on Saturday, while a 4,136-name petition has also been submitted to Cambridge City Council opposing the proposals. The results of the pupils’ poll are yet another blow to the proposals, which campaigners fear will kill off many of the Mill Road’s small shops and ruin the road’s vibrant community spirit. “I would absolutely hate it if all the little businesses were forced to shut down. And 10-year-old Archie Proctors added: “What about the traffic? Max Nentwich, 10, said his investigation had confirmed his feelings about the Tesco plans. He said: “I am absolutely appalled at Tesco moving in on Mill Road. Are we expected to watch as the street’s diversity falls into ruin. However, some pupils were not swayed by the results of their investigation. A Tesco spokesman said: “This will be a small convenience store that will serve many people in the local area. Meanwhile, the issue has continued to split opinion across Cambridge and beyond. Thanks to Sarah W for this video. Come and see our stall at the Mill Road Winter Fair! Also, let us know if you can help in any way. We will be discussing organisation of the stall, and much more, at the meeting on Wednesday 28th November 2007, at 6.30pm at Mill Road Baptist Church. An estimated 300 people braced the cold weather today to march down Mill Road in protest against the planned opening of a Tesco Express store on the street. Local residents, shoppers and traders marched down Mill Road in an act of defiance that will send a strong message to add to the petition of over 4000 signatures already gathered against the proposal. 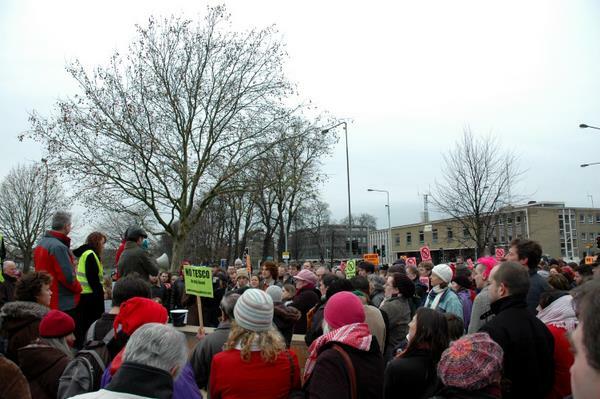 Before the march began, City Council Leader Ian Nimmo-Smith spoke to the assembled crowds. “It is an oddity that the most serious aspect of the proposal of opening a store on Mill Road is something the planning committee can not take into account. That is the great concern that a valuable and unique collection of independent shops could be marginalised and lose viability” he said. Ben Bradnack, City Councillor for Petersfield, added “This is a case of a community which functions as a community. It is the local community which is fighting this battle, and it will be a victory for the local community if we win”. The campaign are now waiting for the decision of the City Council on Tesco’s three planning applications. 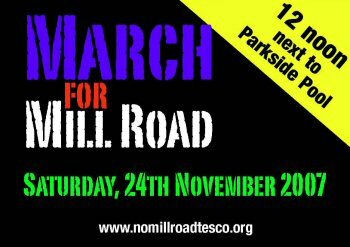 To get involved in the campaign visit www.nomillroadtesco.org. The next meeting will be on Wednesday 28th November at 6.30pm in the Baptist Church, Mill Road. Message of support from the home village of Tesco chief exec Terry Leahy. David and fellow campaigners have been fighting off the planned tesco in their village for some time and they have offered to do what ever they can to support our campaign here in Cambridge. The Keep Chorlton Interesting group has been campaigning since March against the application to build a Tesco Express in Chorlton, Manchester and is a coalition of local people, councillors and independent retail businesses. Last Thursday we won an important step forward in the campaign against the Tesco application. The Council Planning Department’s recommendation was to approve the application. But following our campaign the planning committee councillors voted unanimously for a “Minded to Refuse” motion. We still have a lot of work to do – but this was an important victory. We take heart from Finchley where the Council’s decision to refuse a Tesco Express was upheld by the Planning Inspectorate. We can – and will – win – so can your campaign. Keep Tesco off Mill Road, Cambridge! Category: Uncategorized | Comments Off on Keep Tesco off Mill Road, Cambridge! Mill Road area residents, shoppers and traders will march in a show of opposition to Tesco’s plans to open a store on Cambridge’s liveliest and most cosmopolitan street. 10,000 postcards advertising the march have been distributed in the city, and the organisers expect a huge show of support from people who value the real choice and diversity offered by Mill Road’s independent shops . The marchers will gather on the green beside Parkside swimming pool (known locally as Donkey Common) at 12 noon on Saturday 24th November. Before the march begins, Mill Road shopkeepers and concerned local politicians will say a few words, and there will be messages of support from other groups who are fighting to keep Tesco out of their communities -including some who have succeeded . The march will end at the former Wilco site on Mill Road Broadway, which Tesco had already secured with a 15-year lease before making its plans public. 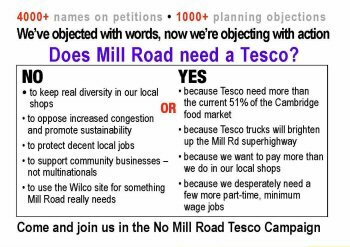 “As we want to cause minimum disruption to the busy life of Mill Road, when we reach the Wilco site we will keep the proceedings brief before dispersing,” said NoMillRoadTesco campaign coordinator Sonia Cooter. Tesco already has three supermarkets and three smaller Express stores in the city, and according to the UK’s Competition Commission, pockets 51 pence out of every pound spent on groceries in Cambridge . Research has shown that money spent at independent shops continues to circulate locally, supporting a range of jobs from window-cleaners to accountants. Supermarkets tend to make use of large cleaning, accountancy and other business services companies from outside the area, and this money – and the jobs it pays for – are lost to the local economy . 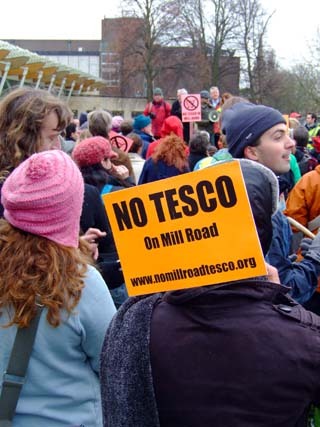 The campaign against Tesco on Mill Road is supported by groups and parties across the community and the political spectrum. 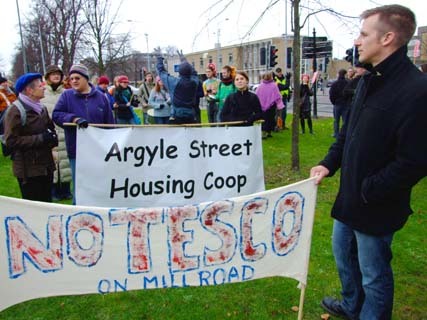 See: http://www.nomillroadtesco.org/action/supporting-groups/ for details. Tesco superstore rejected by Norfolk council – campaigning works! Conservationists have hailed a council’s decision to refuse permission for a Tesco supermarket in the Norfolk seaside town of Sheringham. Councillors from North Norfolk district council took the decision unanimously, by a vote of 17-0, against a recommendation from their officials to approve the 1500 sq metre store. The controversial proposal has been the subject of a ten-year-long battle between the retailer and opponents within the town. It became a cause célèbre last year when it emerged that the council had signed a legal agreement with Tesco that it had kept secret for years, and that as a result of the agreement the council was blocking the development of an alternative, smaller retail development in the town. Officials had warned councillors that they would be liable to pay legal costs if the retailer chose to appeal. The Government’s forthcoming planning Bill would remove the ability of local planners to decide on the “need” for a retail development. Sandra Bell, supermarket campaigner for Friends of the Earth said: “The decision to say No to Tesco in Sheringham is a real victory for the local community and for democracy. “Elected councillors in North Norfolk should be congratulated on standing up to the retail giant and acting to protect the character and vibrancy of this seaside town. Tesco still have an appeal outstanding against the alleged failure of the council to decide a planning application for a virtually identical development in 2003. This has yet to be decided by a planning inspector. Category: Elsewhere | Comments Off on Tesco superstore rejected by Norfolk council – campaigning works! There will be a march on Saturday 24th November 2007. 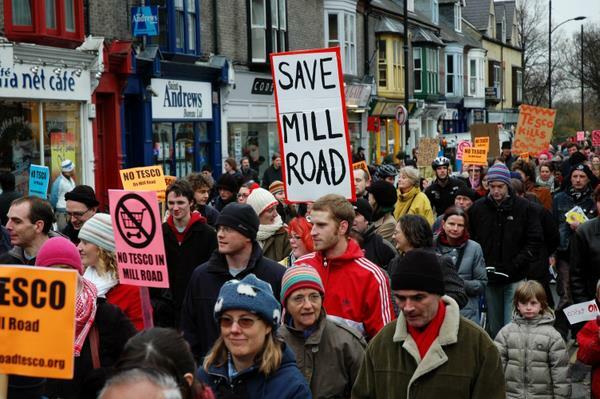 This major event will go down Mill Road and outline the extent of opposition to Tesco’s proposals. Over 4000 people have signed the petition. Over 1000 people have objected in writing to the planning applications. We’ve objected with words, now we’re objecting with action. 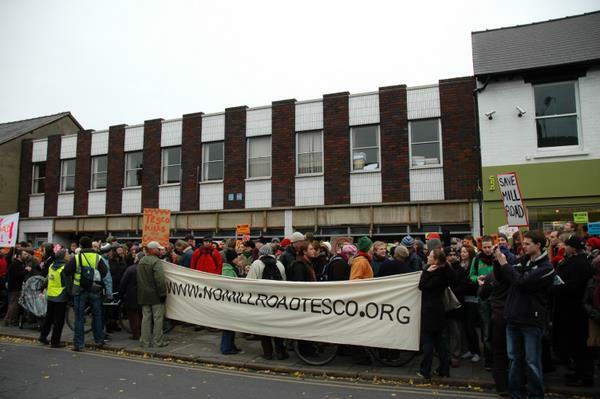 Join us on a march to celebrate Mill Road and to show our objection to the threat posed to it by Tesco. 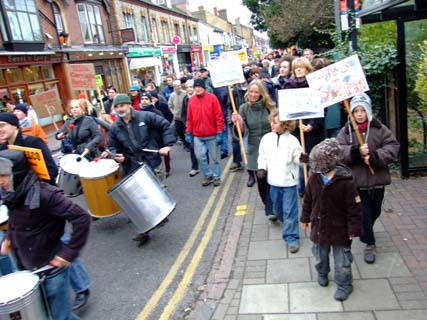 We’ll be marching down Mill Road to the old Wilco site to sound of samba beats. Come and join in the fun! Also, let us know if you can help us with the event in any way.